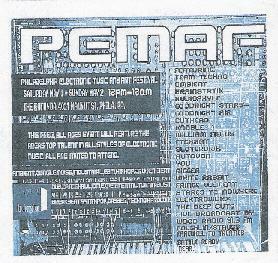 PEMAF documents Sloterdijk's performance at The Philadelphia Electronic Music & Art Festival on May 2nd of this year. Founder Mike Burro is always at the helm, and in this configuration of the band he is joined by Dr. Maria Ramundo on synths. The sound is definitely bootleg quality so I can't recommend this as an introduction to Sloterdijk, but seasoned fans should check out this set for an excellent example of Hawkwind inspired space rockin' electronics. "Alien Inside You" sets the tone for the performance with 14 minutes of dark but highly cosmic space rock. Swirling, comet shooting electronics, pulsating synth waves and Burro's narrative vocal style bring to mind the more keyboard driven moments from the live Love In Space show. "Alien Theme" leads us into more head boppin' rock territory... deep in space of course... and gets mightily intense. We're also treated to killer renditions of "Integration" and "Fred Goldman's Mustache", both from the excellent Integration album, which is a very good place for newcomers to be introduced to Sloterdijk. When you really get down to it, there aren't a whole lot of bands playing Hawkwind styled space rock, writing original music and making the sound their own. But Sloterdijk do an A++ job of it. So with warnings about the sound in mind, live show collectors will be able to listen to this and zero in on the music as it was heard at the concert. For more information you can visit Sloterdijk at: http://www.garageband.com/artist/sloterdijk.